I pinned this DIY image a long long time ago and unfortunately the link doesn't work anymore. That said, this wedding project looks beyond simple. 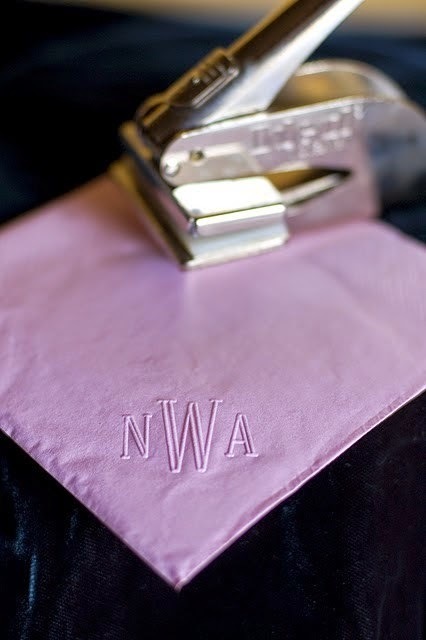 Buy basic cocktail napkins in your colors, order an embosser, (open some wine and put on a fun movie), and stamp away! One tip from my wedding experience: make more napkins than you think you need and keep a stash for yourself! Guests usually go through more napkins than you expect and it's better to have too many than too few. I'd love to see the results if anyone tries this!